Doric Marketing chief Dorian Davies has highlighted Bullfrog Spa’s launch of an online comedy series in an effort to encourage hot tub retailers and wet leisure companies to adopt modern web-based marketing practices. With two appearances as an exhibitor at the UK Pool & Spa Expo and SPATEX under his belt, Dorian is now following up interest in his Doric Marketing services as part of his strategy to revolutionise the way retailers interact with their existing and prospective customers. “Even before I exhibited at the two UK wet leisure exhibitions in the West Midlands I was highlighting the fact that the industry has got to move with the times and adopt modern marketing practices,” said Dorian. “Now, having spoken with visitors to my stands at both shows it is very clearly apparent that there are many different levels of promotional activities being operated within the industry. 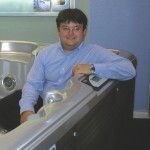 “A number of leading hot tub retailers and wet leisure specialists, who have once again landed prestigious BISHTA and SPATA awards, are tuned into the marketing potential from the latest online technology and have enhanced their websites and social media capabilities to take advantage of the boom in the use of mobile devices. “Many dealers have invested very heavily in new websites that are compatible with mobile devices and are quite rightly reaping the rewards of bumper sales thanks to increased footfall in showrooms. “Then there is now another group of retailers and companies who I am speaking to at the moment who are seeking to catch up with their competitors by adopting similar modern marketing strategies. “Others, though, still seem to be content to be sticking to outdated methods that would have worked well ten years ago but are no longer viable. I’m worried about those in this category because they are not making plans for a long-term profitable future. Dorian believes USA hot tub manufacturer Bullfrog Spas has given its retailer network a tremendous boost by launching ‘The Principal’ web series exclusively for YouTube viewers. It features characters in their 20’s to 30’s to mirror the demographic for the series who are coming close to hot tub ownership or will be in a few years down the line. “This ambitious first series, which completed its debut season on YouTube in December, is Bullfrog Spa’s attempt to capture online viewers with entertainment content, in the same way major brands like Denny’s, IKEA, and Target have already done,” explained Dorian. “It is not just about brand promotion but building up a relationship with online audiences of all ages. In this case it is targeting the ‘millennials’, these are the highly coveted demographic of tech-savvy 20-somethings that are future customers for the wet leisure industry. “They may not be purchasing hot tubs or swim spas now but they are being engaged by Bullfrog’s YouTube series and this is naturally going to help the manufacturer build up a relationship with a young generation of prospective customers. “It may seem a lot of effort to launch a web series as a marketing initiative, but the current viewers of ‘The Principal’ will have gained an affinity with the Bullfrog Spas brand if they do choose to go down the route of hot tub ownership. “Online marketing strategies have to be specifically tailored to this flourishing medium and audience. You can’t adopt the same principles that applied to traditional advertising for radio and TV, or newspapers and magazines. “In previous eras it was all about communicating collectively to mass audiences. Times have changed though, and so has our use of mobile technology to access online content. For further information about how Doric Marketing’s online strategies or modern marketing initiatives can increase footfall to your showrooms by enhancing customer relationships contact Dorian on 01672 841193 or 07780 991000.